A look at some of the innovative young companies who are establishing a Scottish presence in the new space technologies. 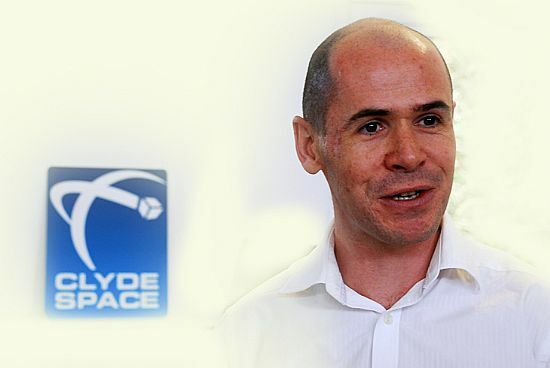 Glasgow-based company Clyde Space is widely regarded as one of the most innovative young companies in the UK and in just eight years has become the largest indigenous space company in Scotland. It produces high quality, high performance systems for very small spacecraft, the so-called CubeSats. Clyde Space was one of the first commercial companies in the world to recognise the potential of the new technology, and it has a 40% share components of the global market for power components for CubeSats. Clyde Space also designs products from scratch, drawing on combined experience of over 50 space programmes. The bulk of its sales are exports – 80% outside the EU and over 95% outside the UK. The company is working on plans for Scotland's first satellite, to be launched in December this year. This is UKube-1, which will be designed and built by Clyde Space for the UK Space Agency. The achievements of the Clyde Space team were marked in 2011 by the Sir Arthur C. Clarke Award for Space Commerce. For Glasgow, traditionally more famous for building ships rather than spaceships, they have developed a new industry sector. The company's founder, Craig Clark, is an invited member of the UK's Space Leadership Council. In this video interview, he and the company's business development manager, Ritchie Logan, describe the work and the vision of Clyde Space and show one of the CubeSats that the company works with. Part of the University of Strathclyde, the ASCL carries out a wide range of advanced research and also provides exciting opportunities for its students to get involved. Its research on orbital dynamics is seeking out new ways for small spacecraft to link up into bigger units and the identification of new orbital vantage points in space. The quality of its work was highlighted in 2011 by the Sir Arthur C. Clarke Award for Space Research Achievement. The Laboratory's director, Prof. Colin McInnes, is also known for his pioneering research into the concept of solar sails – vast, lightweight panels of thin reflective film which are propelled not by fuel but by the pressure of light from the Sun. His work in the field has been recognised by the award from the Association of Space Explorers of the Leonov Medallion. FASTT stands stands for Future Air-Space Transportation Technology, and the Centre was established in 2010 with the aim of being part of a revolution in future air and space travel. It looks ahead to a time when spacecrcaft will be more like the airliners of today. One private company that is leading the way is Reaction Engines Ltd, based in Oxfordshire, and the FASST Centre is contributing strongly to the company's programme, with the aim of helping the development of its vehicle to production. Part of the University of Dundee, the Centre's achievements include the development of the SpaceWire standard for transmission of satellite data, which is being used today in many spacecraft by space organisations across the world. SpaceWire was a breakthrough, standardising the numerous systems for collecting data by satellite sensor and transmitting it down through high-speed links to an earth-based receiving station. The Centre have also developed the PANGU planet and asteroid simulation tool which is being used by the European Space Agency to help design navigation systems for future planetary landers. Environmental data from satellites has been received at Dundee since 1978, resulting in an extremely valuable archive of data for environmental change monitoring and other applications. A spin-out company, STAR-Dundee, produces a wide range of equipment to enable SpaceWire networks and devices to be developed and tested. Steepest Ascent, whose expertise is in signal processing, was founded in 2004 by a group of engineering graduates from Strathclyde University. Their skills are applied in a variety of fields, from satellite communications to voice recognition systems. The market is a growing one, as mobile phones and laptops demand ever-rising standards of speed and quantity in their data connections. The company is developing the on-board computer for UKube-1, packing in to the little CubeSat the kind of computing power that is normally found only on big satellites. The computer on UKube-1 will capture, process and store data. A company that has opened up a highly original market niche is ThinkTank Maths, an Edinburgh-based grouping of mathematicians who specialise in coming up with fresh solutions to complex problems in areas of technology that range from communications to defence. They don't only deploy the latest and most sophisticated mathematical tools to a problem – they also invent new ones if needed. ThinkTank Maths solutions appear in a range of fields – processing a mass of genetic information for animal breeding research or working out the optimum sectors of coverage for a mobile phone network. For space research they solved a challenging problem for the European Space Agency. Testing how the components of spacecraft will cope with the cold of space requires making a mass of tests on individual items and then aggregating it all together. Together, the aggregating took several months. ThinkTank Maths rethought the problem from first principles and came up with a new mathematical tool which reduced the time substantially – down to just a few minutes.